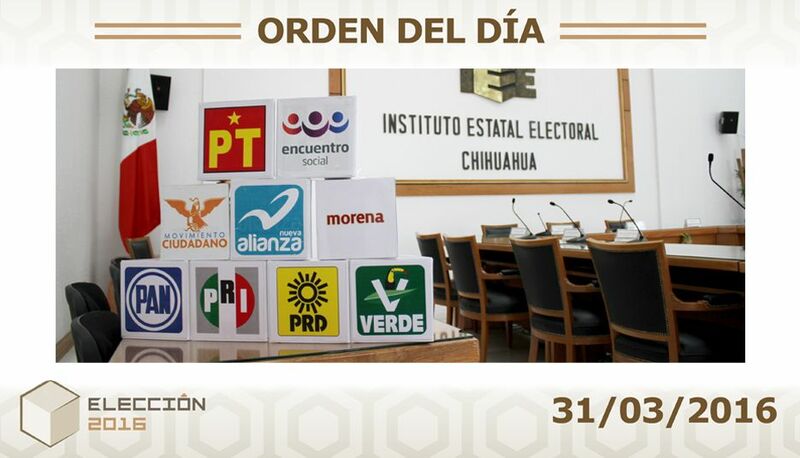 ORDEN DEL DÍA DE LA DÉCIMA CUARTA SESIÓN EXTRAORDINARIA DEL CONSEJO ESTATAL DEL INSTITUTO ESTATAL ELECTORAL DE CHIHUAHUA bPROCESO ELECTORAL 2016. 1. LISTA DE ASISTENCIA Y DECLARACIÓN EN SU CASO DE LA EXISTENCIA DEL QUÓRUM LEGAL. 3. PROYECTO DE ACTA DE LA DÉCIMA SEGUNDA SESIÓN EXTRAORDINARIA, APROBACIÓN O MODIFICACIÓN EN SU CASO. 4. PROYECTO DE ACUERDO DEL CONSEJO ESTATAL DEL INSTITUTO ESTATAL ELECTORAL DE CHIHUAHUA, MEDIANTE EL CUAL SE EMITEN EL CATALOGO DE MEDIOS IMPRESOS Y PERIÓDICOS DIGITALES, LOS LINEAMIENTOS Y EL MANUAL PARA LA REALIZACIÓN DEL MONITOREO EN ESPACIOS NOTICIOSOS EN MEDIOS IMPRESOS E INTERNET, PARA EL PROCESO ELECTORAL 2015-2016. 5. PROYECTO DE ACUERDO DEL CONSEJO ESTATAL DEL INSTITUTO ESTATAL ELECTORAL DE CHIHUAHUA POR EL QUE SE REGISTRAN LAS PLATAFORMAS ELECTORALES PARA EL PROCESO ELECTORAL 2015-2016. 6. INFORME MENSUAL QUE RINDE EL SECRETARIO EJECUTIVO DEL INSTITUTO ESTATAL ELECTORAL DE CHIHUAHUA, EN CUMPLIMIENTO AL ACUERDO DE CONSEJO GENERAL DEL INSTITUTO NACIONAL ELECTORAL DE CLAVE INE/CG220/2014, POR MEDIO DEL CUAL SE ESTABLECEN LINEAMIENTOS PARA LA REALIZACIÓN DE ENCUESTAS POR MUESTREO Y DE SALIDA Y/O CONTEOS RÁPIDOS. 7. PROYECTO DE RESOLUCIÓN DEL CONSEJO ESTATAL DEL INSTITUTO ESTATAL ELECTORAL DE CHIHUAHUA, EN RELACIÓN A LA SOLICITUD DE REGISTRO COMO CANDIDATO AL CARGO DE GOBERNADOR CONSTITUCIONAL DEL ESTADO DE JAIME BELTRÁN DEL RÍO BELTRÁN DEL RÍO POR EL PARTIDO DE LA REVOLUCIÓN DEMOCRÁTICA. 8. PROYECTO DE RESOLUCIÓN DEL CONSEJO ESTATAL DEL INSTITUTO ESTATAL ELECTORAL DE CHIHUAHUA, EN RELACIÓN A LA SOLICITUD DE REGISTRO COMO CANDIDATO INDEPENDIENTE AL CARGO DE GOBERNADOR CONSTITUCIONAL DEL ESTADO DE JOSÉ LUIS BARRAZA GONZÁLEZ. 9. PROYECTO DE RESOLUCIÓN DEL CONSEJO ESTATAL DEL INSTITUTO ESTATAL ELECTORAL DE CHIHUAHUA, EN RELACIÓN A LA SOLICITUD DE REGISTRO COMO CANDIDATO AL CARGO DE GOBERNADOR CONSTITUCIONAL DEL ESTADO DE CRUZ PÉREZ CUÉLLAR POR EL PARTIDO MOVIMIENTO CIUDADANO. 10. PROYECTO DE RESOLUCIÓN DEL CONSEJO ESTATAL DEL INSTITUTO ESTATAL ELECTORAL DE CHIHUAHUA, EN RELACIÓN A LA SOLICITUD DE REGISTRO COMO CANDIDATO AL CARGO DE GOBERNADOR CONSTITUCIONAL DEL ESTADO DE JAVIER CORRAL JURADO POR EL PARTIDO ACCIÓN NACIONAL. 11. PROYECTO DE RESOLUCIÓN DEL CONSEJO ESTATAL DEL INSTITUTO ESTATAL ELECTORAL DE CHIHUAHUA, EN RELACIÓN A LA SOLICITUD DE REGISTRO COMO CANDIDATO AL CARGO DE GOBERNADOR CONSTITUCIONAL DEL ESTADO DE ENRIQUE SERRANO ESCOBAR POR LA COALICIÓN INTEGRADA POR LOS PARTIDOS REVOLUCIONARIO INSTITUCIONAL, VERDE ECOLOGISTA DE MÉXICO, DEL TRABAJO Y NUEVA ALIANZA. 12. PROYECTO DE RESOLUCIÓN DEL CONSEJO ESTATAL DEL INSTITUTO ESTATAL ELECTORAL DE CHIHUAHUA, EN RELACIÓN A LA SOLICITUD DE REGISTRO COMO CANDIDATO AL CARGO DE GOBERNADOR CONSTITUCIONAL DEL ESTADO DE FRANCISCO JAVIER FÉLIX MUÑOZ POR EL PARTIDO MORENA.